Once again, I’m sorry about not getting a post up on Monday. My four-year-old niece was visiting and things were a little…chaotic, let’s say. It’s Wednesday, so it’s time for another lesson. This week, we’re talking about keeping your mind on other things. You might be wondering what I mean by that. Well, let’s put it this way: I’m supposed to get beta reader feedback in less than a week. I’m freaking out more than a little about what they might say. I’m more tempted than ever to bug them about what they think about it. But, I have to keep my mind on other things. 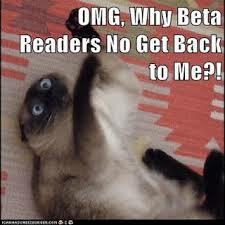 Otherwise, I might lose my beta readers for my next book. That would not be cool. So, what do you do to keep your mind on other things when your precious baby is in the hands of others? You could read a book. You could get started on something else, you could start a vlog. You could get caught up on homework… Or all of the above, as was in my case. There are many, many things you can do. Now, I’m not saying it’s not okay to get in contact with your beta readers to talk about other things. Heck, I do that all the time. But, try to avoid the subject of your book unless they bring it up. I’m bad about that. A couple of them said something about it, and I took that as an okay to talk about it. I’m thinking that may have been a little uncalled for. They do tend to get annoyed after a while. So, what do you do to keep your mind off of your work while it’s in the hands of others? Comment below!